isee systems is proud to have sponsored the 28th International System Dynamics Conference held in Seoul, Korea last month. We especially enjoyed supporting the conference again this year through the Barry Richmond Scholarship Award. 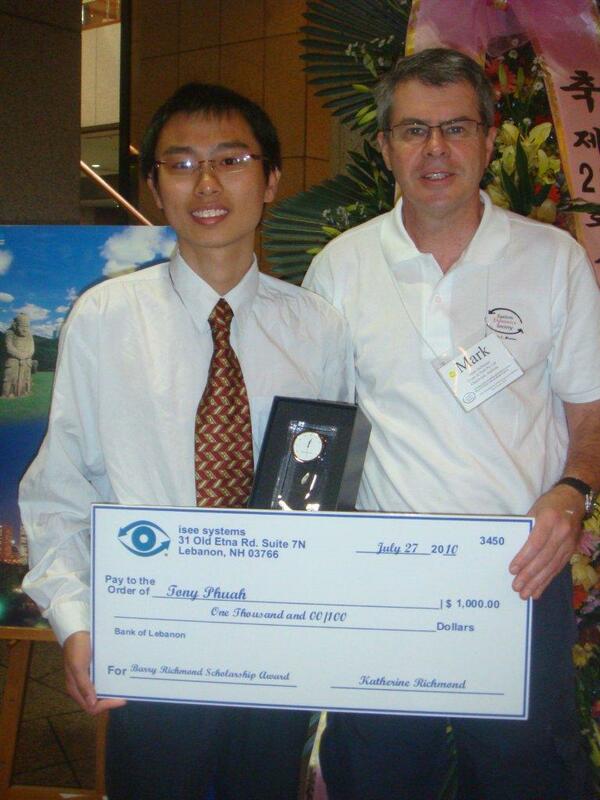 The scholarship was established in 2007 to honor and continue the legacy of our company founder, Barry Richmond. Barry was devoted to helping others become better “Systems Citizens”. It was his mission to make Systems Thinking and System Dynamics accessible to people of all ages and in all fields. Through most of his career Barry saw education as the key to spreading Systems Thinking. As a teacher and a mentor, he dedicated much of his time to developing tools and methodologies for learning. It is fitting therefore that this year’s award was presented to Tony Phuah, a Master’s student in System Dynamics at the University of Bergen. Congratulations Tony and thank you Mark for helping us to celebrate Barry’s passion! Applications for the 2011 Barry Richmond Scholarship Award will be available on the isee systems and System Dynamics Society web sites. Check those sites for more information.